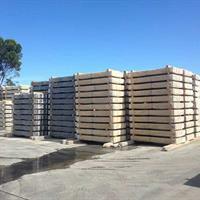 Due to the shear weight and size of our concrete sleepers delivery is not as standard as other building or construction materials and it requires that we use a transport truck with a forklift (manitou). Delivery for this type of transport is not cheap in Sydney and the Central Coast. If you are not within our delivery zone please contact us and we can give you a delivery quote to your area. • Our loading areas can accommodate vehicles with trailers right up to B-double trucks. * Please lift the materials safely and lift smart.